Facing a major funding shortfall, the UN refugee agency for 'Palestinian refugees' is planning to defer payment of salaries and suspend some of its operations in Gaza, an official said Tuesday. 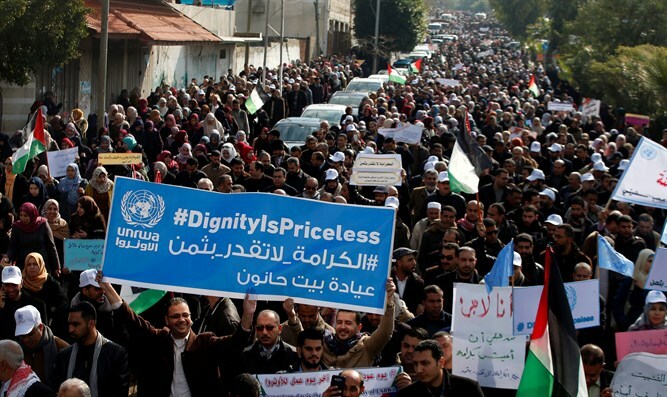 The UN Relief and Works Agency (UNRWA) for Palestine refugees was thrown into severe financial crisis after the United States cut $250 million from its budget. UN envoy Nickolay Mladenov told a Security Council meeting that UNRWA is "weeks away from painful cuts to its emergency assistance for Gaza and elsewhere in the region." "In Gaza, this would include a deferral of salaries to some of its workforce in July and the start of suspending core operations in August," he added. The United Nations on Monday will host a pledging conference for UNRWA in New York - the second such donors' meeting in three months. In March, it raised $100 million for UNRWA during a conference in Rome but fell short of the $446 million needed to keep the agency afloat. schools and health clinics to 5.3 million to the descendants of refugees in Judea, Samaria, Gaza, Jordan, Lebanon and Syria. The cuts to UNRWA services in Gaza come amid warnings from the United Nations that the enclave is close to the brink of war after scores of rioters were killed during violent protests along the border with Israel. In January, President Donald Trump's administration announced that it was reducing its contribution to the agency, arguing that UNRWA was in need of reform. US Ambassador Nikki Haley has said Washington will not restore the aid until the Palestinian Authority agrees "to come back to the negotiation table" with Israel.